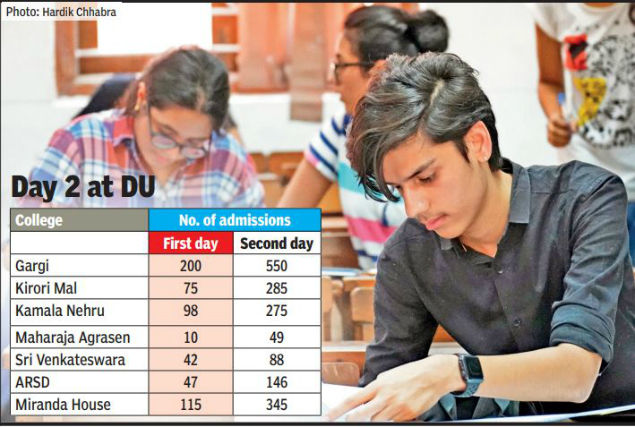 Almost all DU colleges saw a huge turnover of aspirants on Wednesday as many came back to finish their admissions left incomplete due to the server crash on Tuesday. 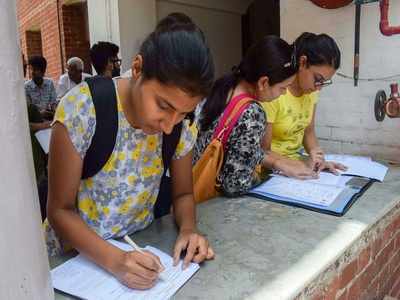 The premises of Hindu, Ramjas, Miranda, Lady Shri Ram, Sri Venkateswara and Kamala Nehru colleges were crowded by applicants and their parents, who waited for long hours to get their documents verified and admission confirmed on the second day. Several colleges also recorded a high number of admissions in some subjects, which may lead to closing of these courses in the second list. Most colleges relied on their volunteer base to help the applicants, especially the outstation ones. “The server crash send the applicants and their parents into a tizzy. Our volunteers stepped in to help them finish the process,” said Divya Sihag, the students’ union president of Gargi College. “Students came in a large number in the afternoon, which extended the process to a little more than expected,” said a volunteer at Miranda House. However, applicants were anxious to finish the process within the short deadline after the loss of a day. “We have already come twice from Gurgaon as the provisional certificates are not being accepted by the authorities,” said Anjana Bhowal, mother of an applicant at Kamla Nehru College. A bigger crowd also meant that the colleges had to deal with delays in completing the process. Shakuntika, from Uttar Pradesh, was anxious about the amount of time the process was taking. “I have been waiting here since 9.30am. It’s been more than two hours but things are not moving quickly,” she said at Miranda. Principal Manoj Khanna said verification was taking the maximum time, especially for BA (P) applicants. “We are also conducting forensic verification of the documents as soon as we get them. We don’t want any student to get to know later that the admission has been denied over such issues,” he said. However, some parents didn’t mind the wait. “We have been here for long but we don’t mind as long as our daughter is getting admitted,” said Sougaijat, the father of a student from Manipur, who was waiting with his wife on Miranda’s lawns.